Drive time is about 35 to 40 minutes. The easiest way is to go to your hotel’s Front Desk and ask for directions to the Freeway West, by way of McCully Street. 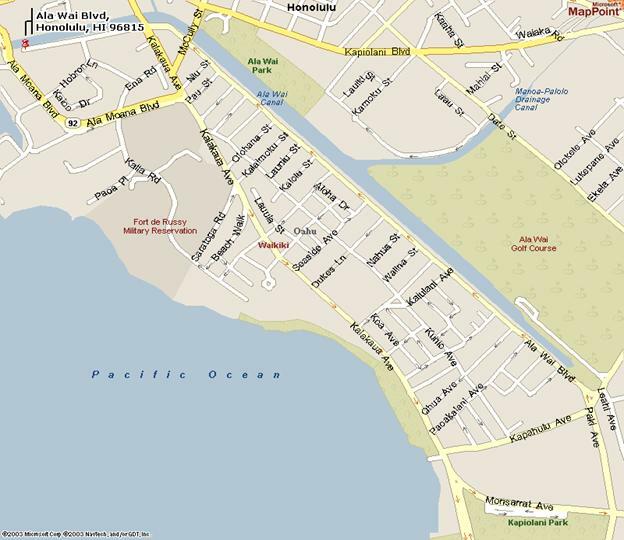 Most hotels have a little street map of Waikiki that they can give you. Head towards the mountains and you will run into a street that runs alongside the Ala Wai Canal. Turn LEFT onto Ala Wai Blvd. Move into the RIGHT LANE closest to the canal. At the first turn, at the first bridge, make a RIGHT TURN onto McCully St.
As you make the turn at McCully St. and start over the bridge, it may be useful to set the “Trip Counter” on your Odometer to read 000.0. Make your way LEFT to the CENTER LANE. Go STRAIGHT on McCully St. towards the mountains. At the intersection of McCully St. and Beretania St. there is a KFC on your left and a Shell gas station on your right. Go THROUGH the intersection and UP OVER the bridge, following the "H-1 WEST" signs. Go STRAIGHT over the bridge, at the bottom turn LEFT, following the signs. At the 4-way stop, turn LEFT. Follow the signs. You are now entering the Freeway H-1 WEST bound. Work your way over to the CENTER LANE. 5.2 Keep going STRAIGHT in the CENTER LANE. There will be a sign above the freeway saying Exit 19B, 78 WEST, Fort Shafter & Aiea. Stay where you are. Go up and over Red Hill. 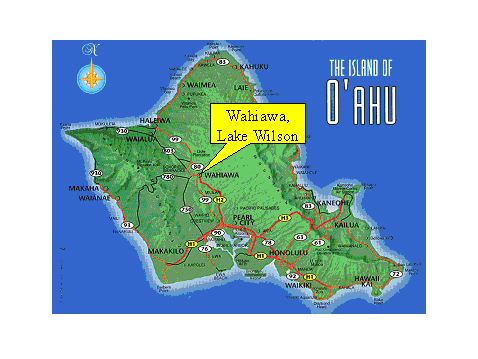 (The road you are on is 78 WEST Moanalua Freeway.) As you reach the top of the hill, you will see the Waianae Mountains in the distance. The big brown space ship looking building ahead and to the left is Aloha Stadium. If you are still in the center lane, move one lane to your right... the next sign above you will read: H-1 WEST, Pearl City ONLY. Keep on this road. Now you’re on the H-1 WEST again. See the tall condos on the left? On the right is the Pearl City Golf Course. Stay RIGHT. The 2nd and 3rd lanes on the RIGHT will turn into the H-2 NORTH Freeway about 5 miles ahead. Take EXIT 8A, (Two RIGHT Lanes) NORTH, Mililani & Wahiawa. **DO NOT TAKE THE WAIPAHU EXIT!! You are heading NORTH towards Wahiawa & Schofield Barracks. Stay in the middle lane. You will BYPASS Exit 2 Ka Uka Blvd. You should be going under an overpass named “Pineapple Road”. You will BYPASS the next 2 Exits also: Exit 5A Mililani Mauka & Exit 5B Mililani Town. Take EXIT #8, Wahiawa; stay in your RIGHT LANE. Immediately after crossing the bridge TURN RIGHT at the light onto Avocado Street. In about 50 yards, at the corner, TURN RIGHT. Now go about 100 yards and THROUGH the gates into the park. There are Restrooms on the right. TURN RIGHT just past the Restrooms and go down the hill to the parking lot and boat launch ramp….. You are there.